I'm so excited to be sharing this post with you today. Partly because I just love putting together interiors posts, but mainly because it means our living room is actually finished! Well, it's not totally finished - we still need some new curtains and some shelves, but it is looking a million times better than it did when we moved in in March. Redecorating it has taken us much longer than anticipated. We started stripping the wallpaper back at the end of September with the ambition of getting it all cosy in time for autumn hitting, but because we haven't really been in Leeds that much at the weekends, we've only had week nights to play with. When we moved in the living room had a horrible textured wallpaper and had been painted a very shiny yellow/cream colour - it was pretty gross. But we loved the floorboards and the fireplace, so we knew that with a bit of work we could get it looking nice. We started by stripping the wallpaper and painting it grey (like every other room in our house - we have a problem!) and giving the ceiling and coving a fresh lick of white paint to brighten it up. We could still do with giving the floorboards a sand down, but I think that will probably be a job for the new year now. Next up, it was time to add all of the essentials for a cosy living room, starting with cushions! The grey ones were from Primark - they have a velvety texture and were such a bargain! Sam actually bought me the letter cushions for Christmas from George and I'm so glad that they are finally taking pride of place in a nice living room almost a year later. On the other sofa we have more of the grey cushions and some gorgeous pink faux fur Primark ones too which have a slight ombre to them. I have to admit that Sam looked a little bit traumatised when I brought these home but I love them! We also have a gorgeous quote cushion from B&Q that my Mum bought us when we moved in and a cosy throw. This one was from last winter, but they have got another similar one here if you like it. No cosy living room is complete without the addition of candles, is it? Having lots of them burning at the same time definitely brings the hygge factor. I do however always struggle with what scents to go for and usually end up buying conflicting fragrances that give me a headache! Not very cosy. So when Amara invited me to take their quiz to find my perfect home fragrance I was really intrigued - I wasn't quite sure what the result would be! It turned out that "fresh" was the scent that most suited my personality and home, so I set to work with choosing a couple of candles that fit within this fragrance type. My first choice was this Neom Feel Refreshed candle. I had this burning when the girls were round last weekend and every single one of them commented on how lovely it smelt - it really does pump out a lot of fragrance, but not in an overpowering way. I find it really calming. Next up was this beautiful Voluspa candle in Mokara - can we just take a minute to appreciate how pretty this jar is?! I love the texture and the scalloped edges, it really does add a little something to the room. The scent of this one is much more subtle and a little bit sweeter, but when burnt together they really compliment each other. Alongside my lovely fragranced candles, I also have a couple of unscented ones too. All of the candle holders and the gold tray are from H&M home which is just THE BEST for cheap little decorative bits (plus they have 20% off everything this weekend!). Last but not least, I wanted to get a couple of decorative bits for the top of the fire. 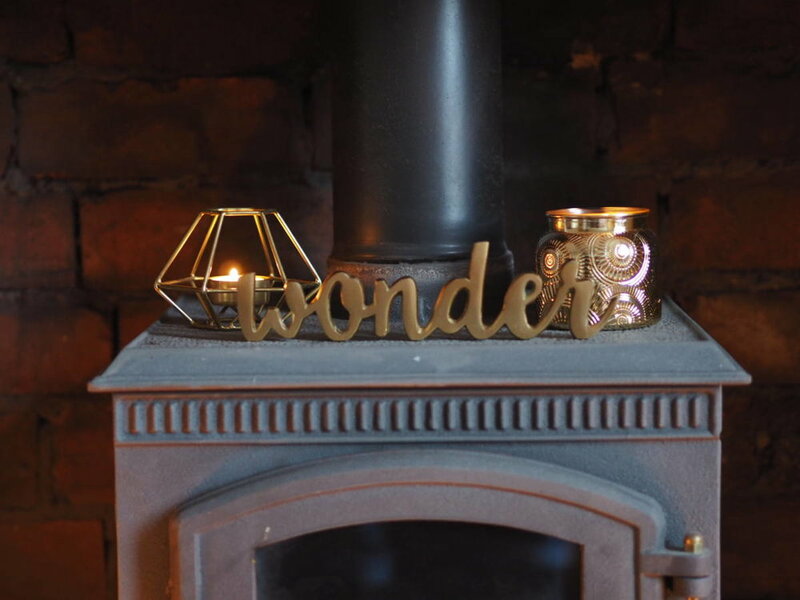 I am OBSESSED with this little "wonder" sign from M&S - it really reminds me of the West Elm ones but for a fraction of the price! The gold candle was a birthday gift that I love - isn't the jar so pretty?! - and the other candle holder was also from H&M. Like I said, we still need to get some shelves to style up and some other little bits, but I am SO happy with how it's looking! What do you think? *This post was in collaboration with Amara, but all opinions and living room cosiness are my own!